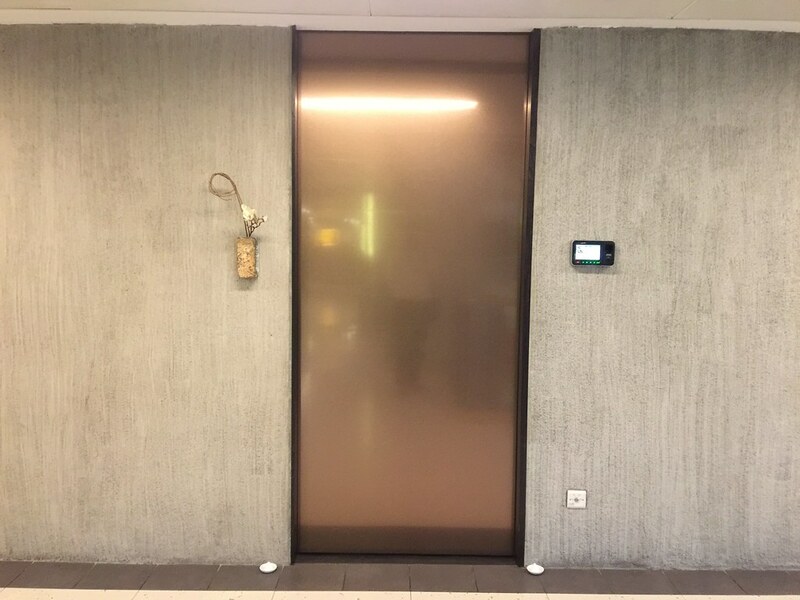 I have heard about this hidden restaurant - Kappo Shunsui at Cuppage Plaza where there is only a golden door and an access via the biometric scanner. To gain entry, you need to ring the bell while VIPs have their fingerprints registered. 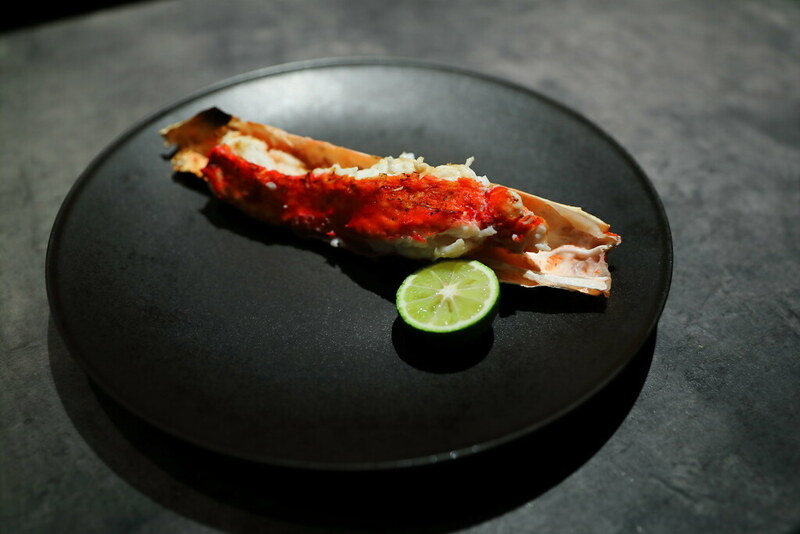 Kappo Shunsui offers kappo-style omakase with just 19 seats (11 counter seats and 8 regular table seats). 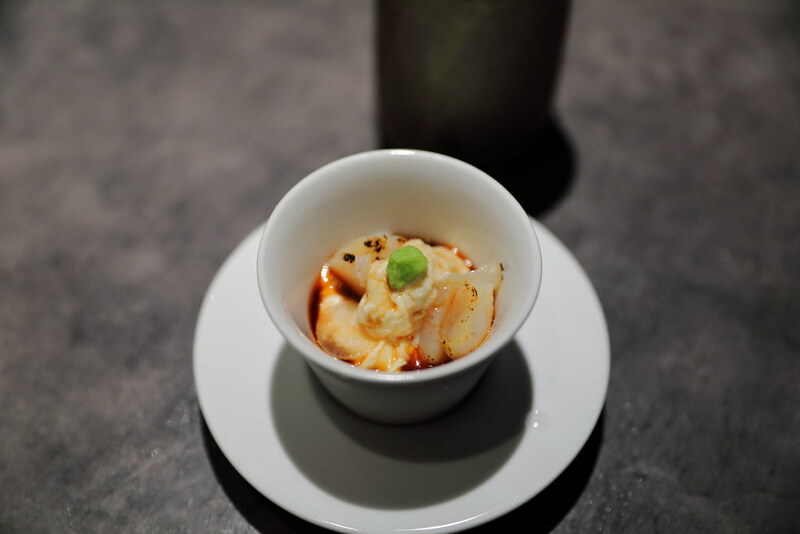 There are only 2 items on the menu, 8-course omakase ($150++) and 9-course omakase ($250++). 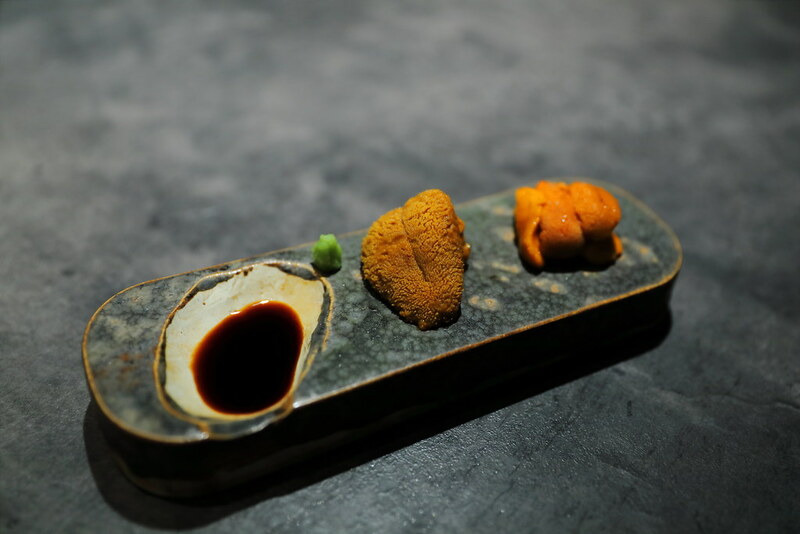 I tried the 9-course omakase menu ($250++) which presents the cooking technique of grilling, steaming, frying, simmering and raw preparation. 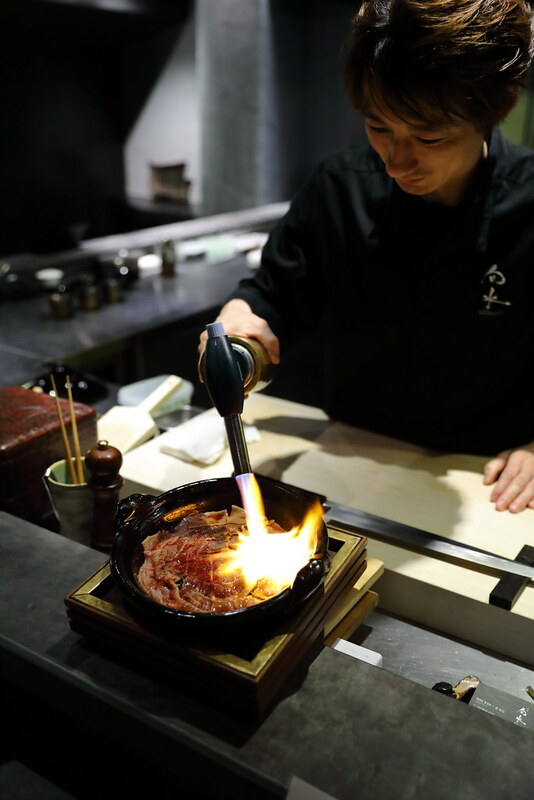 The new menu is put together by the new Executive Chef Nishi Nobuhiro, who is the sixth generation of his family's 200-year lineage of chefs. He even trains under legendary Chef Hideki Ishikawa, owner-chef of Tokyo's 3 Michelin starred restaurant, Kagurazaka Ishikawa. 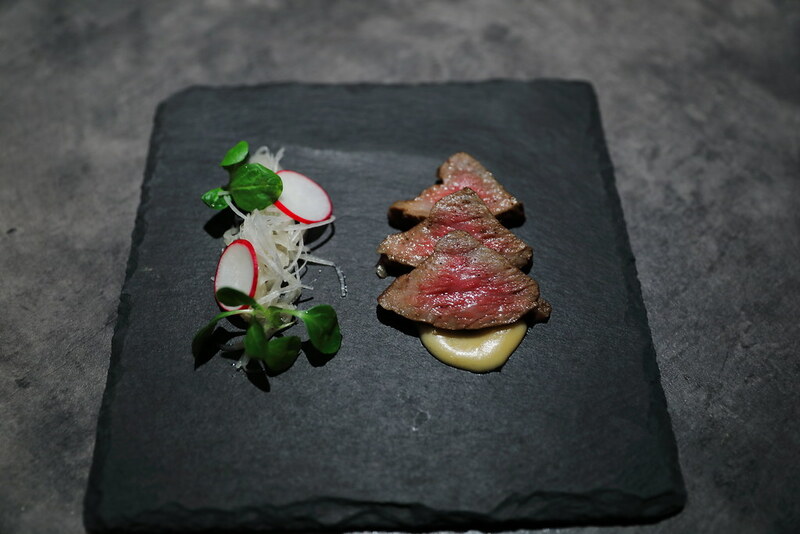 The first course is a showcases of the seasonal produces. 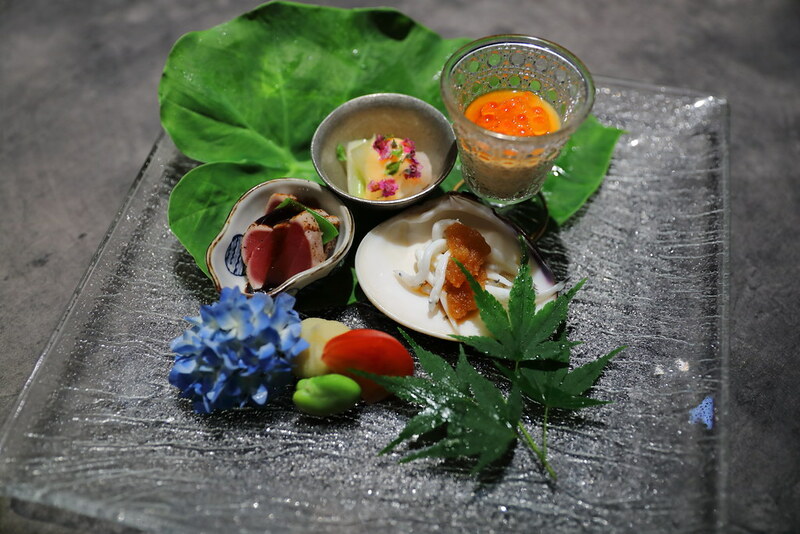 The Appetiser platter consists of Soramame, Ameera Tomatoes, Sweet Potato, Shirauo with Grated Radish & Soy Sauce, Botan Shrimp with Grated Radish & Soy Sauce, Cold Chawanmushi with Ikura, Fatty Tuna with Balsamic Sauce. The Minced Oita Hamaguri and Asari Clams Soup may seems like a simple dish but it actually took a a lot of effort. 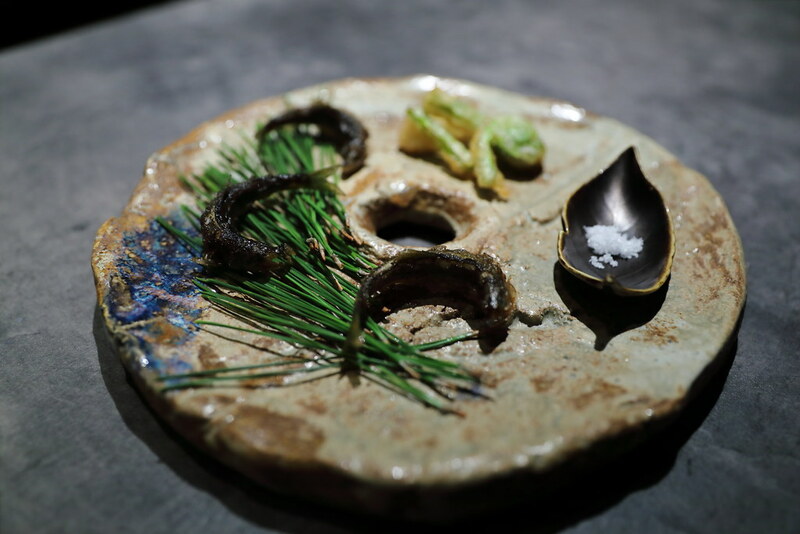 Kombu and dried bonito are soaked overnight in a mineral water to extract the sweetness. 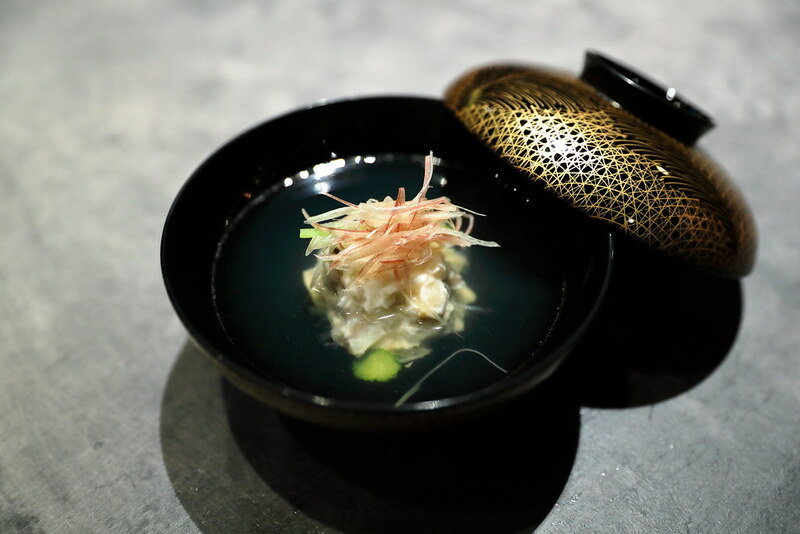 Chef Nobu even shared with us that he only boils the dashi to 90 degrees to retain the sweetness of the dashi. An unique item in the soup is the homemade Shinjo (fish cake). 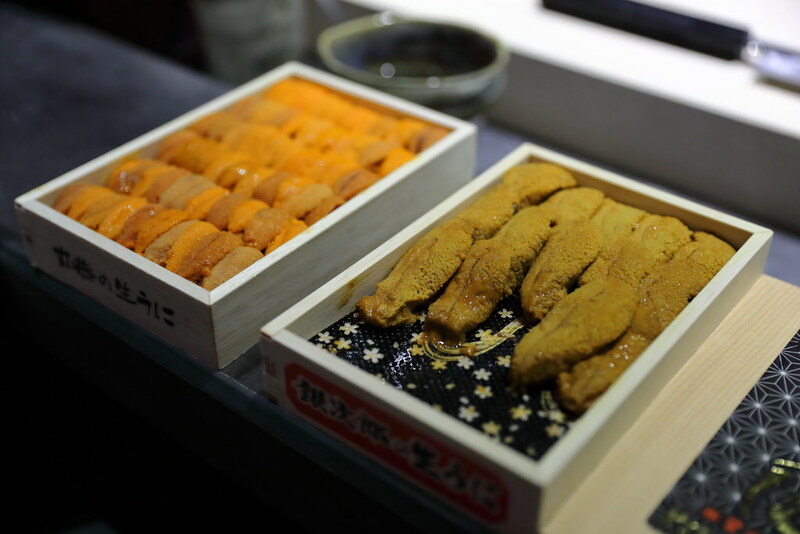 The fish paste is made up of five different seasonal fish meats which is light and bouncy. The freshness of the 5 Kinds of Seasonal Sashimi will delight everyone who appreciate Japanese cuisine. 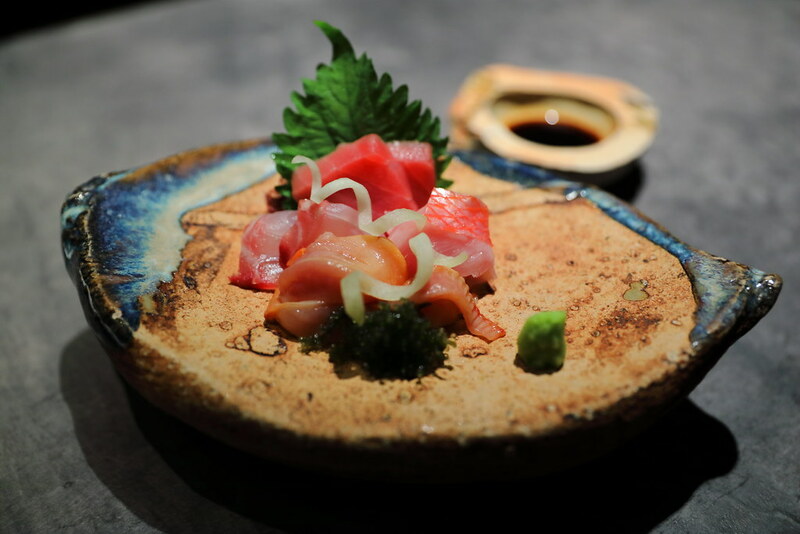 We started with the Medium Fatty Tuna, Golden Eye Snapper, Akagai, Isakai and Umibudo. What stands out for me is the Akagai for its crunchy texture on top of its natural sweetness. I have eaten Bafun Uni many times for its creaminess and sweetness but this is my first time having the Murasaki Uni. Murasaki uni is darker in colour and longer in size. It has a grainy texture and a slight unami bitterness. Its like having hairy crab roes. 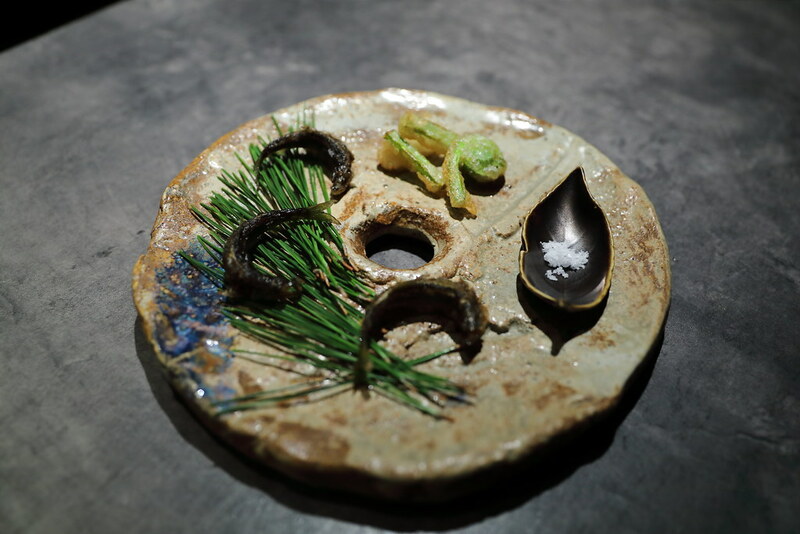 For the fried item, the chef presents a beautiful painting of Fried Chi Ayu (Baby Sweet Fish), Ostrich Fern and Udo Vegetables. It's a bit like eating shishamo, whereby you can bite into the whole fish. However I didn't quite like the bitterness from the innard of the Chi Ayu, throwing the enjoyment slightly off. The next dish is the Kyoto Raw Tofu Skin and Hokkaido Scallops. The star is the homemade sauce by Chef Nobu, made of soy sauce, shiitake mushroom, sake, mirin and lime. The sauce beautifully brings the 2 unlikely combination together for a delightful finishing. 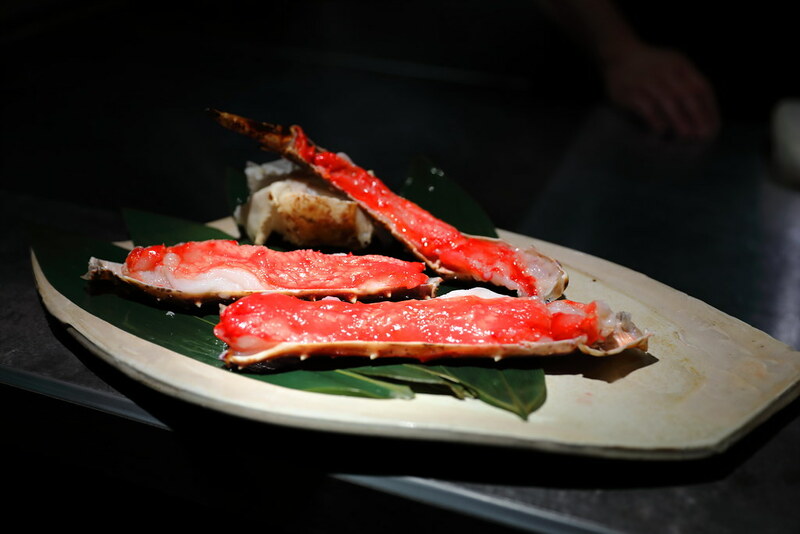 The Charcoal Grilled Hokkaido King Crab is huge, plump and juicy. The chef even grilled it with sake to get it an extra lift in sweetness. I would recommend squeezing the lime over the crab meat, for that extra boost in flavour. The Kagoshima A4 Roast Sirloin Beef is cooked to a nice pink inside while the exterior is pan seared to get an aromatic char. The highlight has to be the A4 Kagoshim Wagyu Claypot Rice. 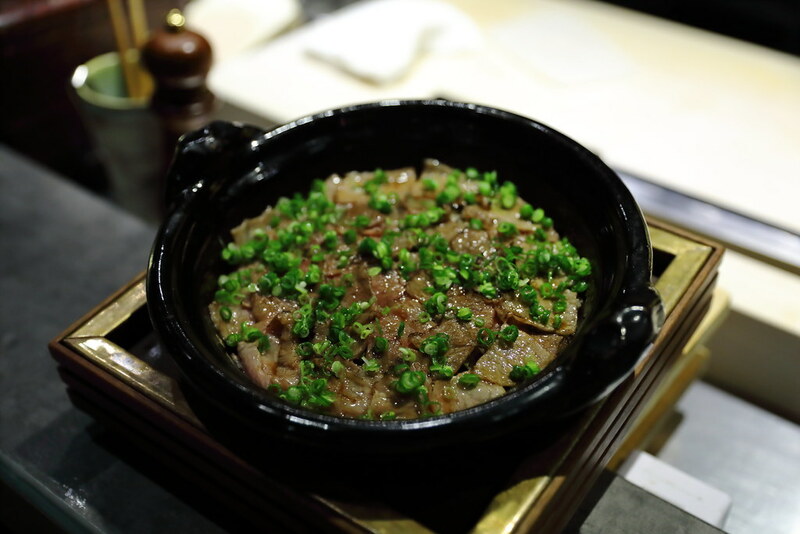 The waygu beef is first blow torched before topping with spring onions. The rice and beef is then mixed together with a special soy-based sauce before serving. What make it even more special is the used of peppercorn for that spicy mala numbness. Wrapping up the 9 courses meal is the Homemade Bracken-starch Dumplings and Fruit. 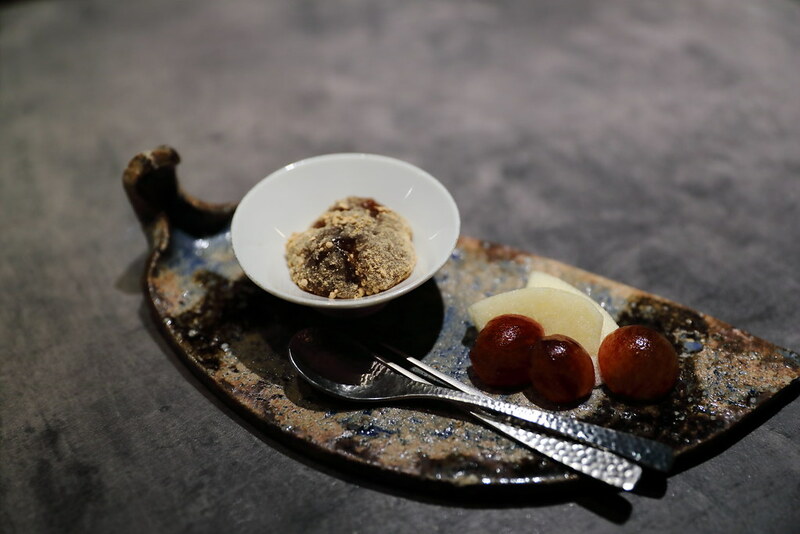 Bracken-starch dumpling is more commonly known as warabi mochi. For diners that appreciate having a drink with their meal, you can go for the sake pairing for an addition $69++, that comes with 6 different types of sakes.